First page up is p174: here Wiseman is looking into what makes things funny and, specifically, an experiment he carried out to find the world’s funniest joke. The project also provided considerable insights into many of the questions facing modern-day humour researchers. Do men and women laugh at different types of jokes? Do people from different countries find the same things funny? Does our sense of humour change over time? And, if you are going to tell a joke involving an animal, are you better off making the main protagonist a duck, a horse, a cow or a weasel? I mean, don’t you just want to know the answer to all of those questions? His research provided a lot of fascinating insights into humour. For me, one of the most interesting elements was that apparently to English speakers, the letter K is inherently humourous – think Krusty the Clown – and apparently within standup comedy this is a well-known phenomenon. Another, perhaps more saddening insight, is that most people find jokes funny because it makes them feel in some way superior to the person in the joke. But, really worrying is that these jokes can actually have an effect on how people behave. For instance, they got a random group of women to read out some jokes and then complete an IQ test. Half of them were asked to read ‘dumb blonde’ jokes and the others just told some more generic jokes. The blonde women who had read the dumb blonde jokes performed substantially worse in the IQ test than those in the control group. This suggests that jokes can control people’s confidence and personality and suggests that even if they don’t want to, people are likely to conform to stereotypes. Our next stop is at p28 where Wiseman is describing research he did into whether people born at particular times of year were luckier than others (or at least believed that they were luckier than others). The research found that people born in the summer months were luckier than the winter-born. The hypothesis therefore was that it was something to do with the temperature around birth having an impact on the person’s long-term personality. To test this, they repeated the experiment in Australia and they found, again, that those born in the Australian summer (December) were luckier than those born during the Australian winter. So, you might think, maybe there is something in all this astrology stuff after all – fear not, Wiseman then goes on to describe some great experiments that have been done to debunk astrology. But he also looks into what luck is, and why some people are luckier than others -essentially it comes down to how open people are to opportunities that come their way. This is later demonstrated through a six degrees of separation game, sorry, I mean piece of research, that I really want to play involving a cross-continental game of pass the parcel. This suggests that people who experience a sense of spirituality in church may be reacting to the extreme bass sound produced by the pipes. Further support for the idea came from one pipe manufacturer who informally told the team that, given the sounds from the pipes are inaudible, they can be viewed as either a very expensive way of creating a small draught, or a cost-effective way of helping the congregation find God. Finally, p76 discusses an experiment into memory, in which they tricked people into believing that as kids they had been on a balloon flight, by showing them a photoshopped picture of their younger selves in a hot air balloon. They found that people were able to tell them about the day, where their parents were and why they were in the balloon even though it had, in fact, never happened. Frighteningly a number of research studies show that if a figure in authority tells us that something happened, our minds will immediately start filling in any gaps from our imagination. A sobering thought for a Monday night. I won’t go on with more examples but there is a fabulous bit about the psychology of personal ads and how if, as a woman, you are looking for love, you are far better off getting a man to write your advert for you. There is some great research into names and why places called St Helen attract people called, well, Helen, and why there are so many marine biologists called Dr Fish. My highlight of this book though came on page 252 when Wiseman started discussing the research of Robert Levine. Yes, that’s right, the same Robert Levine whose book, A Geography of Time, I read a few weeks ago! I already know this, Mr Wiseman, I thought. Who is the big shot psychology know-it-all now?? Huh??? No, no, let me tell YOU about Levine’s research into pace of life and whether people return envelopes. Another one to add to your TBR pile (or To Be Read pile, for the non-book-bloggers among you). 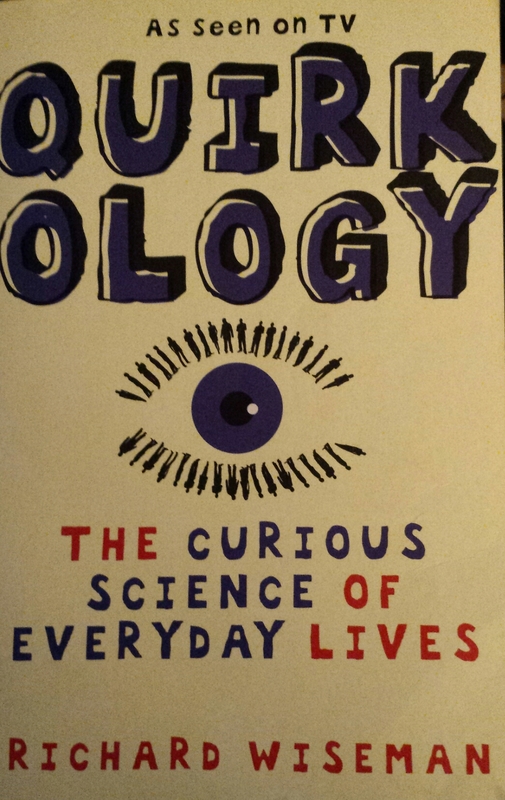 Tags: book, book review, books, humour, psychology, quirkology, research, Richard Wiseman, science. Bookmark the permalink. This sounds awesome! I’ll definitely check it out. If you’re ever interested in some great book reviews and musings, be sure to follow! Thanks!!! Thanks – it really is a fascinating read! A copy of Quirkology is flying its way down to my Kindle as I write. Sounds like my sort of book. Made me laugh on a rainy Tuesday. Good skills!